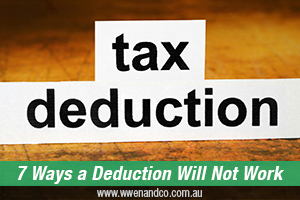 If you are planning to claim higher than expected deductions during tax time this year then you may expect to come under the watchful eyes of the ATO. Make sure your claims for work-related expenses are right by using the series of occupation guides or other general advice available on the ATO website. These guides help people in specific industries understand and correctly claim the expenses they may be entitled to. You must have spent the money yourself and not have been reimbursed. You must have a record to prove your expenditure. myTax – your claims are compared with the claims of taxpayers in similar occupations and with similar income, giving you a real-time warning if your claims are unusually high in comparison. myDeductions tool in the ATO app – lets you record your expenses without having to worry about lost or faded receipts and can be uploaded to myTax or your registered tax agent for your next tax return. A dairy farm employee claimed deductions totalling almost $19,000 including expenses for travel, tractor hire, tools and safety gear, internet and phone. When the ATO spoke to his employer, they said the employee’s duties involved milking cows and changing irrigation. He was provided free rent in a house beside the farm where he worked and he was not required to travel elsewhere for work purposes. The employer also provided a tractor, although the employee didn’t need to use it to undertake his duties. The employer confirmed that the employee was not required to use his mobile phone or internet for work purposes and that he was provided with all the tools and work gear he needed to undertake his duties. The employee’s deductions were disallowed in full. The ATO educated him about his entitlements and warned him to undertake proper inquiries before making claims in future. A tiler lodged his tax return using a registered tax agent and claimed over $4,000 in deductions relating to his car (based on transporting bulky equipment), travel and tools. To verify the tiler’s car claims, the ATO contacted his employer who confirmed that he was not required to transport any equipment to work that would be considered bulky – just a few pencils and a utility knife. The employer also advised that secure lockers were provided at the work site to store tools. When asked to provide records of the travel and tools expenses, the tiler produced receipts for car parts, and receipts for all-day parking at the same workplace (not for travel between different work sites or jobs). The tiler’s claims for purchasing tools, carrying bulky equipment and car parking were disallowed because they were private expenses, not directly related to earning his income. A computer network engineer claimed over $4,000 in deductions relating to car, travel, clothing and other work-related expenses, as well as the cost of managing his tax affairs. When queried, the engineer told the ATO he travelled interstate for both work and private purposes, his clothing expenses were for the purchase of general business attire and his claims for managing tax affairs related to managing the family trust. We reminded the soldier to keep a backup of any receipts related to future claims. There is an option available in the myDeductions tool. We highly recommend you regularly backup your data in case you can no longer access data on your device – for example, if you lose your phone.